The challenge is to capture photographically a beautiful or unusual physics phenomenon and explain it in less than 200 words in terms that everyone can understand. Open (industrial and government establishments and commercially-funded research, universities, community colleges, charity-funded research programs, teachers, laypersons, others). 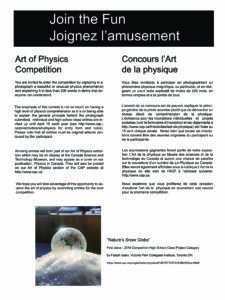 To enter the competition, complete the 2019_Art_of_Physics_Entry_Form and send it with your own original artwork to the CAP from March 15, 2019 to April 15, 2019. The entry fee is $5 for category 1, $10 for category 2 and $10 for category 3. The winning entries and honourable mentions from all categories will be added to the CAP’s Art of Physics exhibition. A certificate acknowledging their achievement will be sent to winning participants. 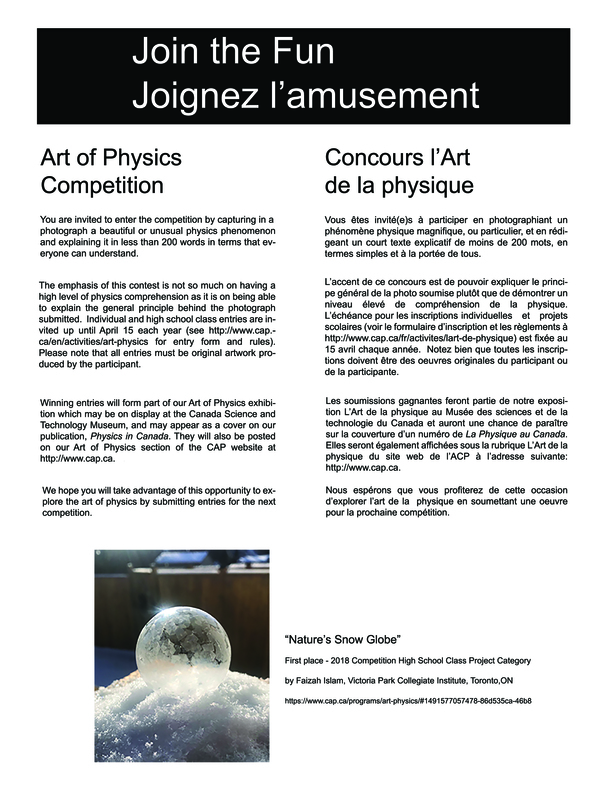 Some entries may be selected to be featured as a future cover for Physics in Canada. The teacher of the winning team (Category 2) will receive an engraved plaque for the school as well as a one-year complimentary high school teacher membership in the Canadian Association of Physicists. Prizes will be awarded in May 2019. Prizes awarded may not be exactly as described herein.